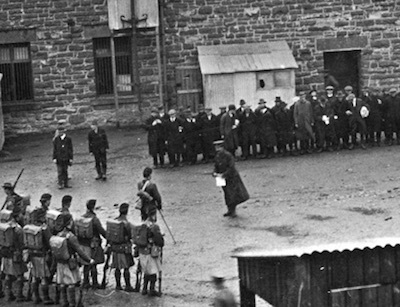 The PoW camp, on the site of an old whisky distillery outside the town of Bala, held rebels such as Michael Collins, Terence MacSweeney and Richard Mulcahy. It became known as ‘The University of Revolution’, as it was here that plans were discussed for future attacks on British rule in Ireland. “During the summer, we sent an invitation to President Higgins to come here on the centenary of 2016,” said Councillor Alwyn Jones, who lives nearby. Without Frongoch, the IRA could not have attained the efficiency and professionalism it was able to demonstrate in 1919. Personal bonds of friendship were established amongst prisoners from opposite ends of the country. Command structures and intelligence networks were established or prepared with strategic planning ready to be implemented as opportunity arose. The GPO may have been the birthplace of the war for independence but Frongoch was its creche. A small plaque was placed here by the Liverpool branch of Conradh Na Gaeilge in 2002. A school has been built on the Southcamp site, with the Northcamp’s location now farmland. “It was here that young rebels like Michael Collins learned from fellow older rebels - and, remember, it brought together rebels from all over Ireland and placed them on one site. It was a huge mistake by the British government,” said local Welsh natonalist councillor Elwyn Edwards. The camp housed German POWs prior to Irish republicans being brought in. It was chosen because escape was all but impossible, with the nearest large town 20 miles away. Prisoners quickly established Irish classes and sports events. One field is still known locally as ‘Croke Park’ because Gaelic games were played there. Chris Ruane, a former Labour MP in this constituency, believes the time is now right for appropriate commemorations at Frongoch. His grandfather Tommy Ruane, from Galway, was interned here in 1916 for republican activities in Carnmore.